What's the Best Treehouse Wood? - Treehouse by DesignTreehouse by Design - So, you thinking about building a tree house? What’s the Best Treehouse Wood? What’s the best treehouse wood? At some point in the planning process, you have to consider what materials you’re going to use to build your treehouse. The best treehouse wood for you certainly depends on how much money you have to spend, and how long you want your treehouse to last. Often less considered, but more important considerations are your health and the environment. It’s often said that the best treehouse wood is free wood. If you want to spend as little as possible, salvaged wood is a great option in terms of cost and ecological footprint, since you’re reusing wood that would otherwise be going to the landfill. The best woods to use are redwood (sequoia), western cedar, the red heartwood of eastern cedar, and cypress. All of these have natural rot-resistant qualities that will ensure your structure lasts for decades (provided your treehouse is built well enough to last that long). Here’s a handy guide to help you figure out the best treehouse wood to salvage or buy. If you can’t find salvage redwood, cedar or cypress, and you don’t have the money to buy it, your alternative is using any other wood and then treating it with a good sealant. I recommend against using older pressure treated wood, especially if you’re building a treehouse for children, as it has concentrated arsenic in it. That’s bad for people and bad for nature. This outdoor wood selection guide warns against even more recent non-arsenic pressure treated wood, so do your research and use your own judgement before proceeding. Synthetics: A Modern Treehouse Option? The best treehouse wood for you may not be wood at all. There are composite and vinyl boards on the market. Composite boards are a fusion of recycled plastic and wood. I’ve heard mixed reviews about these synthetic options. For one, they’re not natural and often don’t look natural, which can defeat a lot of the esthetic purpose of a treehouse. Also, because they don’t absorb and release as much (or any) moisture, they trap water wherever they come into contact with wood, which will accelerate the wood’s decomposition – the exact opposite effect this technology seeks to achieve. Also, synthetics cost a lot more than wood, can require more skill to install, and need more supports than their wood counterparts. All of these factors mean a substantial increase in building costs. They can also get very hot in the sun — not ideal for children playing in the summer. You can read more on these points here. Vinyl doesn’t have the structural strength to be used for supporting joints, beams or joists. Also vinyl can get brittle and chip in areas with extreme seasonal fluctuations in temperature. On the upside, synthetics last indefinitely, are highly water resistant or waterproof. They may be a good option for people living in wetter places. You should inform yourself about the potential problems, though, before making that decision. Choosing your best treehouse wood and sealants can be a pretty personal choice based on many factors including health and environmental concerns, what woods are available in your area, price, strength, longevity, and appearance. If you’d like to improve this post by sharing your experiences with some of these materials, please take a moment to leave a comment. 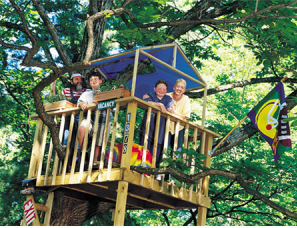 Enjoy the rest of your treehouse season…and remember, there’s still time to build one! « A John Lennon Celebrity Tree House?